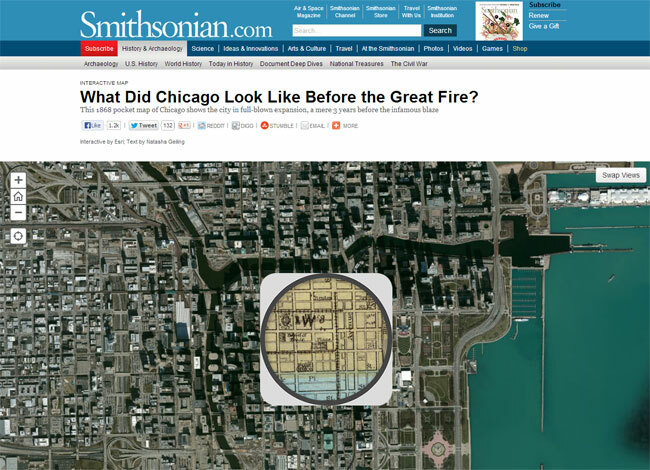 Among the current top stories on Smithsonian’s website is a “then and now” perspective of a handful of cities using David Rumsey’s historical maps and current aerial imagery in an interactive application. The applications were built using one of the Esri story map templates, specifically the popular swipe/spyglass template which lets the user drag a “spyglass” to see through the current aerials to view the underlying historical maps. Viewers can click Swap Views to view the aerials beneath the historic maps. The featured cities are Chicago, Denver, Los Angeles, New York City, San Francisco, and Washington, DC. Many of David Rumsey’s maps are published via ArcGIS Online, and you find them in his group or by searching all content using the keyword Rumsey. For more information visit Storytelling with Maps.